A Huge congratulations to Jessica and all who LOVE 5 out of 4 Patterns! It’s been an awesome 4 years for 5 out of 4 Patterns. I’m so fortunate that I found Jessica and 5 out of 4 Patterns almost four years ago. While I didn’t test her first pattern, The Knot Your Average Shirt & Dress, I was fortunate to meet her and test her second. I’ve been hooked on 5 out of 4 Patterns since then. The awesomeness that is 5 out of Patterns even inspired me to go on a RTW fast 4 years ago. Would you believe that I’m still on that same fast. Once I started I couldn’t stop and believe it or not it’s been 4 years since I’ve gone clothing shopping for myself. My closet is filled with 5 out of 4 makes and I’m never going back! This week we have all kinds of fun planned and I’m here to share it all with you. Let’s start with the SALE! There’s a site wide sale going on right now through the 27th. Don’t miss out! We’ve split these sponsors up throughout the week in order have giveaways EVERY SINGLE DAY! Join us in the 5oo4 Facebook Group and on Instagram because we’ll be having a great time! It’ll be easy to get involved and easy to enter! In addition to the great giveaways we have another pattern release set for this week. I couldn’t be more excited! Last but, certainly, not least, don’t forget about the GRAND PRIZE! You have until the end of the month to enter so you better get moving. Check this Blog post for all the info! 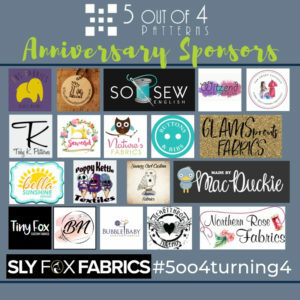 A huge thank you to So Sew English for being a part of our Grand Prize Anniversary Celebration! Don’t forget about 5 out of 4! We’ll be giving away Gift Cards all week long! 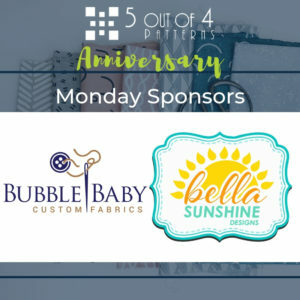 Comment on this blog post and tell us how long you’ve been a fan for your chance to win a $25 store credit to Bubble Baby Custom Fabrics! 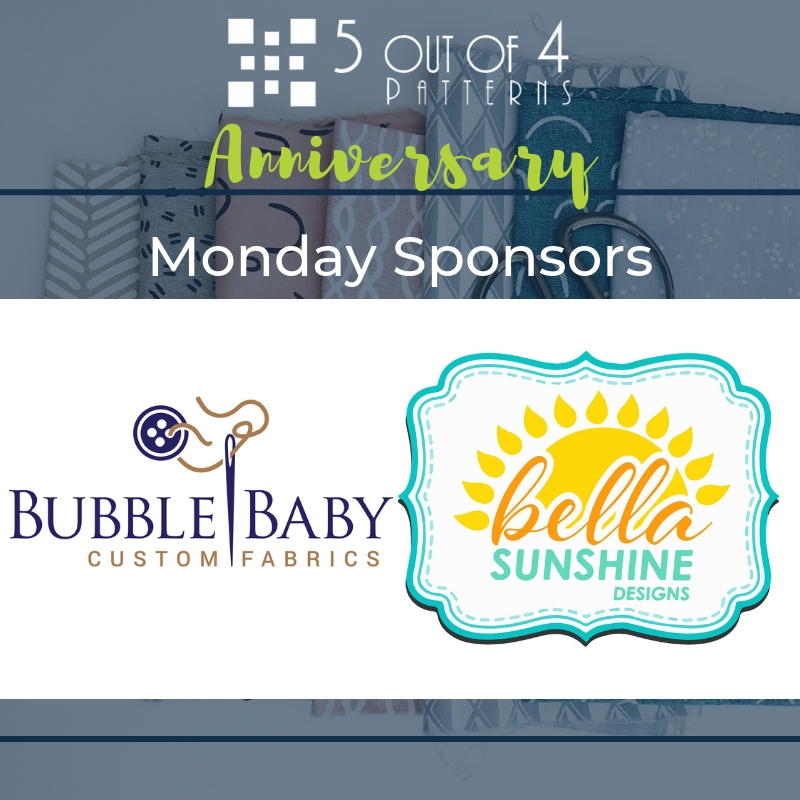 Be sure to stay tuned on Facebook and Instagram for more giveaways TODAY from Bella Sunshine Designs and 5oo4! I’ve been a fan for over a year now! I’ve been a fan since late 2017, although my first 5oo4 make (the Knot Your Average top) wasn’t until 2018. For a couple pf years..been following closely for almost 6 months nw..Im loving the new patterns too much!! I just checked and I purchased the Knot Shirt on 5/7/2015! I have been a fan that long! I love 5 out of 4 patterns!! Congratulations and Happy 4th Birthday!!! I have been a big fan of 5004 since I first tested the Camilla Cowl dress in March of 2017! I’ve been a fan since I started sewing last year! I’m new to knits but I’ve been a fan since I found you!! I’ve only known about your company for less than a year, but I think you’re great! I’ve been a fan for a year now! Congrats on 4 years!! 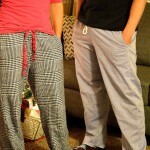 Joined 9mths ago when I found the PJ pants pattern!! I bought my first pattern, Knot your average shirt and dress a year ago! Love how easy the patterns are! Love you he patterns and tutorials! New to the site and group but quickly made the Nancy Raglan and haven’t looked back. 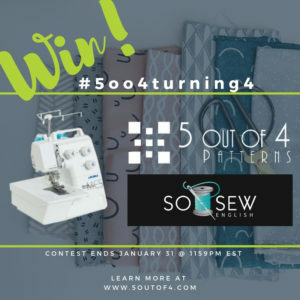 I’ve been a fan of 5oo4 for a little over a year now…when I picked back up sewing. Thanks! Been a fan since I started sewing, about a year and a half ago. January 2019. Just found you! I’ve been a fan since 2015, when I first found 5oo4 – specifically, the adventure skort. I think I’ve known about 5 out of 4 for maybe a year or so. 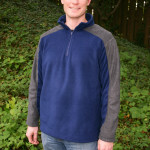 I tried the Nancy Reglan as my first sew with 5oo4 and I love it! I’m not exactly sure when I learned about 5oo4 patterns. I’m thinking maybe a year ago and I do love the pattern I’ve tried, the Shenanigans Skort. I’m looking forward to trying more patterns. Just became a fan but happy to be here! I’ve been a fan for probably two years now. 😊 Happy anniversary! I’ve been sewing knits for a little over a year, but I found 5oo4 about 6 months ago. Love your patterns! I discovered 5oo4 about 8 months ago and I’ve been hooked ever since! Love your patterns and your testing process! Congrats Teletha! You are the winner of the $25 store credit to Bubble Baby Custom Fabrics! Please email Tasha at tasha@5outof4.com to claim your prize. Thanks for playing! I’ve only been using Pdf patterns for a few months but am loving what I’m finding. I just discovered you this week! I don’t remember when I joined, but it was for the PJ pants! I started following 5outof4 in 2017. I have been a fan since 2016! 5oo4 was my first pdf pattern company and it’s bren my favorite ever since! I found y’all about 2 years ago. Since December 2018! I was looking for a skort pattern and there it was. I have made it and I hope to get one more made before my cruise in March. 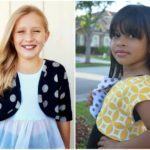 I’ve been a fan of 5oo4 for 3 years — I started out with your free Ninja pattern and now have so many of your patterns. I love them all — the fit, the options, the drafting and the tutorials. I’m glad you’re here and I’m a big fan!! Since January 2016! I wish I had found you from the beginning like Laura! I’ve been a fan for just over 1 year! My first pattern was the agility tank about 1 year ago! Thank you! I have been following since Fall of 2018 and I love your patterns! I don’t remember when I purchased my first pattern but I’ve been a fan every since that first one. Your patterns are to easy to put together. I love and use them all the time. About a year!! Love your patterns! !